MindShift Gear and Wildlife photographer Moose Peterson have an announced the Moose Pack series of backpacks, an update to three classic Moose Peterson backpacks designed for wildlife and safari photographers. Moose Packs. The MP-7, MP-1 and MP-5 updated backpacks. Available in three sizes, the MP-1, MP-5 and MP-7 can carry up to three dSLR camera bodies with telephoto lenses as large at 600mm attached. The backpacks also feature the "Moose Ear" flaps that close automatically, protecting camera gear from dust and debris common in wildlife photography. And because nature photographers often travel to remote locations, the packs are designed to meet airline carry on requirements and even fit in the overhead compartment of the smallest regional jets. 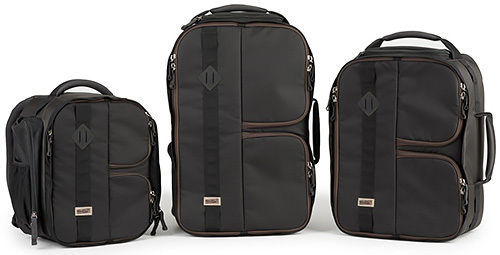 "Moose Peterson backpacks are renowned for serving the needs of traveling photographers," said Doug Murdoch, Think Tank Photo's CEO and lead designer. "It has been a joy collaborating with him on bringing these classic designs back to the marketplace. While their design and materials have been enhanced, the designs of all three backpacks retain Moose's original vision." SANTA ROSA, Calif. -- Working in partnership with renowned wildlife photographer Moose Peterson, MindShift Gear has updated the three classic Moose Peterson backpacks. Initially designed for wildlife and safari photographers, the backpacks feature a three-compartment layout that helps protect their gear from the elements. The Moose Pack series is available in three sizes: MP-1, MP-5 and the smallest, the MP-7. The backpacks can carry up to three dSLR camera bodies with telephoto lenses attached -- up to 600mm f4. This strategy enables photographers to be ready to capture wildlife at any distance without changing lenses or exposing the sensor to the elements. The backpacks also feature the same innovative "Moose Ear" flaps that close automatically, protecting camera gear from dust and debris common in wildlife photography. And because nature photographers often travel to remote locations, the packs are designed to meet airline carry on requirements and even fit in the overhead compartment of the smallest regional jets. Moose Peterson is a recognized Nikon USA Ambassador, Lexar Elite Photographer, recipient of the John Muir Conservation Award and Research Associate with the Endangered Species Recovery Program. He also shares his knowledge through writing, being published in over 143 magazines worldwide, authoring 28 books including Photographic FUNdementals and Taking Flight and Captured and lecturing across the country to thousands of photographers. As one of the original Nikon shooters to receive the D1 in 1999, Moose became the first wildlife photographer to shoot strictly digital. Original 1998 'Moose Ears' design with auto-close compartment flaps protect the interior from dust, spray, wind, etc. Exterior: For superior water resistance, all exterior fabric has a durable water-repellant coating, plus the underside of the fabric has a polyurethane coating. The backpacks also feature highest-quality abrasion-resistant YKK RC-Fuse zippers, 420D velocity nylon, 600D polyester, 1680D ballistic nylon, 320-GB DuraStretch mesh, nylon webbing, 350-GB airmesh, nylon webbing, 3-ply bonded nylon thread. Interior: high-density velex, 210D silver-toned nylon lining, hexa mesh pockets, high-density closed-cell foam, 3-ply bonded nylon thread.